The Lord of the Rings: Two Towers DVD is the latest instalment of J. R. R. Tolkein's epic adventure that has been brought to the silver screen by director Mark Jackson. The story takes place immediately where the previous movie, The Lord of the Rings: Fellowship of the Ring finished and after the fellowship was split, the very fate of Middle Earth was at stake. The story revolves around Frodo Baggins (Elijah Wood), the ring bearer and a hobbit who has been given the task of destroying the one ring. Joined with Samwise Gamgee, his childhood friend and the insidious and realistic CGI character called Gollum (Andy Serkis), the trio desperately try to get to Mordor to destroy the ring. If they fail in their task, the ring may corrupt Frodo and the dark forces of Mordor may finally cast its evil shadow on the world of Middle Earth. As the story continues directly from the previous movie, the human ranger Aragorn (Viggo Mortensen), the lithe like elf Legolas (Orlando Bloom) and the powerful dwarf Gimli (John Rhys-Davies) continue their journey after the two hobbits Merry (Dominic Monaghan) and Pippin (Billy Boyd) that were captured by Uruk-Hai and Orc forces. Their journey soon takes them into the lands of Rohan and one of the most epic battles to have ever graced the silver screen in a war that could destroy Middle Earth itself. Unlike the previous movie, the sequel is a brilliant action movie that captures much of the magic of J. R. R Tolkein's world of Middle Earth. Director Mark Jackson, helps move the storyline along nicely with his own unique vision of the Middle Earth, not to mention some brilliant special effects and the professional acting abilities of the cast. The video quality of the disc is perfect and is shown in an aspect ratio of 2.35:1 (16x9 Enhanced) that has brilliant picture quality, bright colours and no artefacting whatsoever. The CGI of the movie has been flawlessly integrated into the movie and because of the picture quality, you can really appreciate the effort the special effects department has done on the film. The audio quality of the disc supports a variety of formats that of course includes Dolby Digital 5.1 and sounded tremendous from my Philips Home Entertainment system. The voices and sound effects were crystal clear and match that with the majestic musical score of Howard Shore and you have a match made in Tolkein heaven. 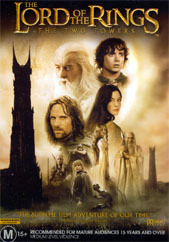 This version of The Lord of the Rings: The Two Towers contains a variety of special features that include a brilliant menu system, a variety of featurettes that include "On the Set", "Return to Middle Earth", "The Long and Short of it", "The Making of the Long and Short of it" and a plethora of The Lord of the Rings.net featurettes such as the creatures of middle earth and the battle of Helm's deep. There are also various trailers and TV spots, music videos, a special extended DVD edition preview and of course the Return of the King preview plus a preview of EA's Return of the King video game. In conclusion, if you really can't wait for the special edition feature of this movie, then I suggest that you buy this title but if you are a perfectionist and wish to see the best edition of the Lord of the Rings: The Two Towers than I strongly suggest that you wait till November for the full version. Highly Recommended!